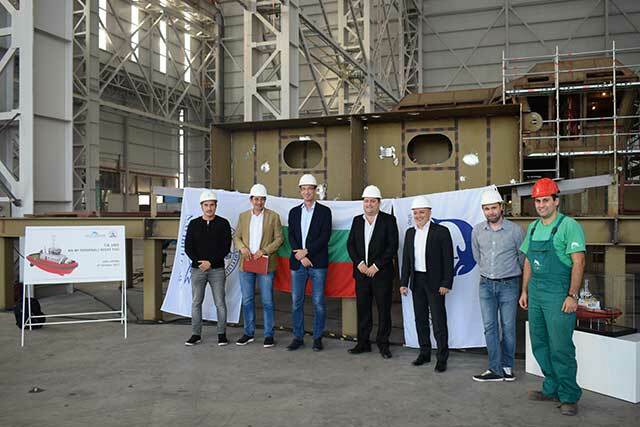 In early October, Varna-based MTG-Dolphin Shipyard laid the keel of a 40 t. bollard-pull Azimuth Stern Drive (ASD) tugboat. This is the second vessel of a series of four multi-purpose tugboats, capable of ship handling and coastal towing, which MTG Dolphin has been building for Navigation Maritime Bulgare (Navibulgar), a Bulgarian shipowner with more than 30 bulk carriers. The first vessel of the series, named Alcor, was delivered to Navibulgar in June of this year.